Lotions for Acne | Nicosia | Cyprus - Pharmacy Nicosia | Bridge House Pharmacy Nicosia "Bridge House"
ALFA NOVA is a potent skin protecting cream enriching the skin collagen and neutralizing the free radicals that cause aging of the skin. When used regularly it causes increase of the dermis thickness thanks to retinol (vitamin A). The skin looks young and supple and wrinkles are visibly reduced. It also helps the skin recover from solar light exposure. Use this cream day and night for ever young looking skin. 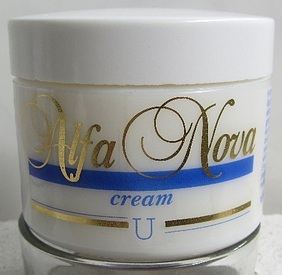 ALFA NOVA also contains vitamin E to enhance its antioxidant properties against free radicals, vitamin B5 for a supple and shining skin and sun filter for even higher sun protection. Water (aqua), cetostearyl alcohol, glycerine, dextropantothenol and propanediol, vaseline, octyl-methoxy-cinnamate, polyethylene glycol 1000 monocetyl ether, cimethicone, retinyl acetate and helianthus oil, tocopheryl acetate, disodium salt of ethylene-diamino-tetra-acetic acid, butylated hydroxytoluene, paraffin oil, isopropyl myristate, carbopol, triethanolanine, propyl paraben, methyl paraben.